It was another big race win for Cho Kyoung Ho as Geumgangi swept to victory in the Munhwa Ilbo Cup at Seoul Race Park this evening. And the jockey followed it up by guiding long-shot Victory Town to an unlikely victory in the Seoul Kyeongje Sinmun Cup just thirty minutes later. Geumgangi was sent off fourth in the betting in a race which was marred by chaos at the start after Blooming reared in the gate bringing down Daehanbobae in the neigbouring stall. Both were ruled unfit to start after being checked by the vet. When the remaining twelve did get underway, there were further distressing scenes as Mr. Swing broke down rounding the final turn. Meanwhile, at the front of the race Cho and Geumgangi got their act together in the home straight to get the better of a pair of outsiders, Choedaepungseok and Tamnaseontaek who filled out the placings. 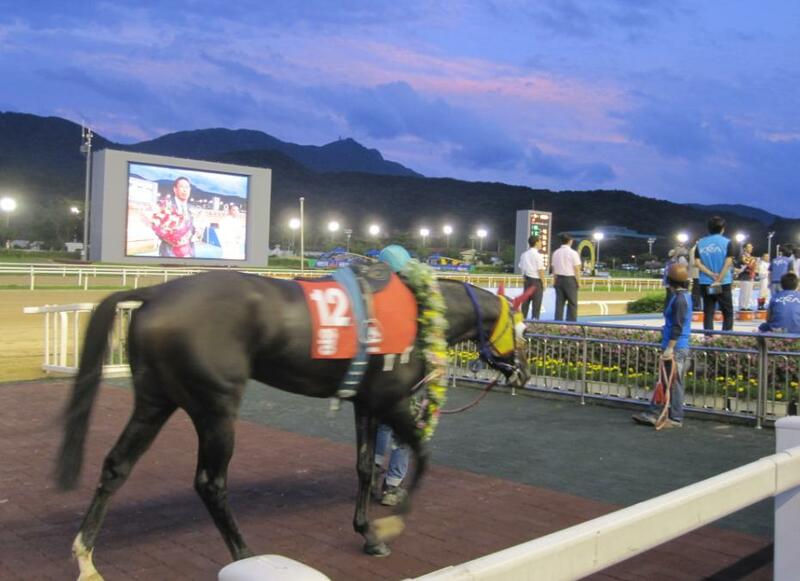 It was a third consecutive win for the improving Geumgangi. Once the ceremonies were complete, Cho re-emerged for the Seoul Kyeongje Sinmun and pulled off an unexpected win when the appropriately named Victory Town comfortably got the better of odds-on favourite Angus Empire by three lengths. That completed a treble for Cho, who is now closing in on Moon Se Young at the top of the jockeys’ championship, after he also won on favourite Balhaemyeongjang in race 6. Lady rider and trainer-in-waiting Lee Shin Young scored a battling victory on Nike Seven in race 5 while four-year-old gelding Bichui Adeul finally broke his maiden at the twenty-sixth time of asking in race 8. Racing on the peninsula now takes a (very) short summer break and actress Kim Tae Hee was on hand once more to see punters off on their holidays. Kim and actor Yang Dong Geun were filming the final race-day scenes for their movie “Grand Prix”. Busan and Jeju take a break as Seoul hosts the only racing on the peninsula this coming weekend. And everything’s set for another big weekend under the lights. Sunday’s Munhwa Ilbo Stakes is the most valuable race of the weekend though the category 2 field, while setting the pulses racing, is certainly competitive with Luxury Jewang heading a full field of 14. On Saturday, Ace Galloper renews hostilities with fellow three-year old Seonbongbulpae with Lucky Mountain, Love Cat and Free Woody joining them in what looks like a cracking handicap. Meanwhile, after the Munhwa Ilbo on Sunday, Serendipper makes her first appearance since her shock win in the Owner’s Cup last month. 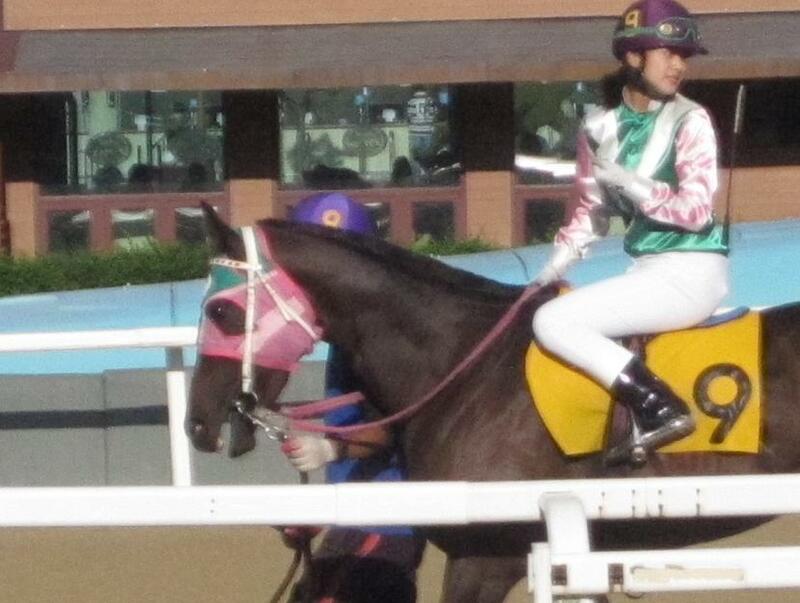 Interestingly, while Kim Tae Hee has her own specially designed green, white and pink racing silks, the leading lady also wears all time leading jockey Park Tae Jong’s silks and leading man Yang wears those of young jockey Choi Won Joon – to whom he bears a passing resemblence. More official stills from the movie can be seen here. Gyongmaman is disappointed to see himself blurred out in the paddock shot, but if you want to see his exclusive behind the scenes pictures click here!. Grand Prix is scheduled for an autumn release. 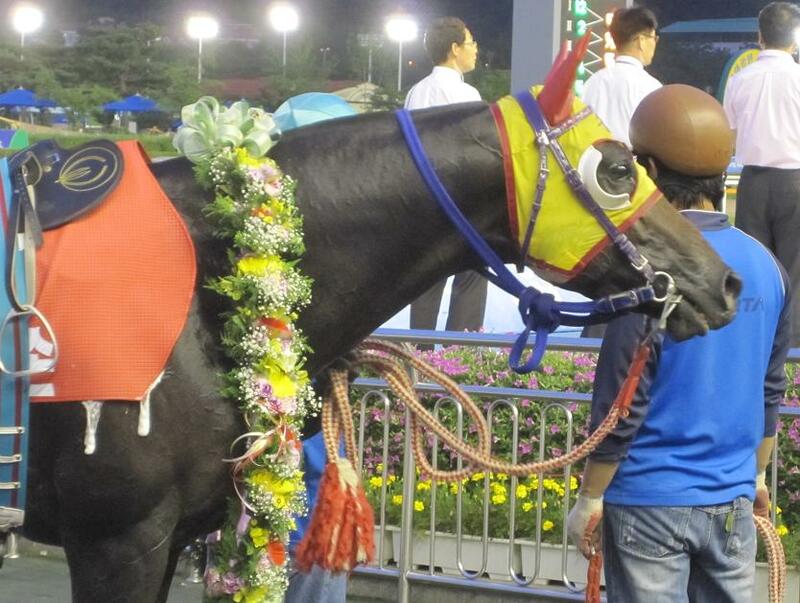 Dongbanui Gangja’s reign as the undisputed best horse in Korea came to a crushing and ignominious end in the Busan Mayor’s Cup this evening. The five-year old, always a handful for his jockey, careened out of control as the field entered the home straight, lurching across the width of the entire track until he reached the grandstand rail while the race went on without him. He’d done this in his last race two months ago but that day was up against sufficiently weak opposition for it not to make a difference to the result. Today was different. Moon Se Young had brought the champion into contention in the back straight and was perfectly placed to launch his usually devastating late charge. However, as they turned for the final time, it became clear that Moon was fighting a battle with his mount that he was destined to lose. It is then the three-year old Tough Win who emerges from the race as both the victor and new Number One on the peninsula. For the first time in his eight race career though, it was a very tough win. Even after Dongbanui Gangja had excused himself from the business end of proceedings, an epic battle was fought in the final furlong. Tough Win, always towards the front, had grabbed the lead two furlongs out but early leader Vicar Love, in a surprising return to form, stayed on to keep fighting until the final strides. Even more threatening was Yeonseung Daero storming up the rail. One of just two Korean bred horses in the field, the four-year old was finishing the fastest but couldn’t quite get up. Tough Win and Cho Kyoung Ho held on to win by a neck with Vicar Love a further head back as they crossed the line together. So it’s eight out of eight for Tough Win. He was pushed but he didn’t crack, however, many will wonder what Dongbanui Gangja have done if he had stayed straight. Tonight, that is irrelevant. Tonight we have a new champion. It wasn’t just at Busan where the shock was felt. 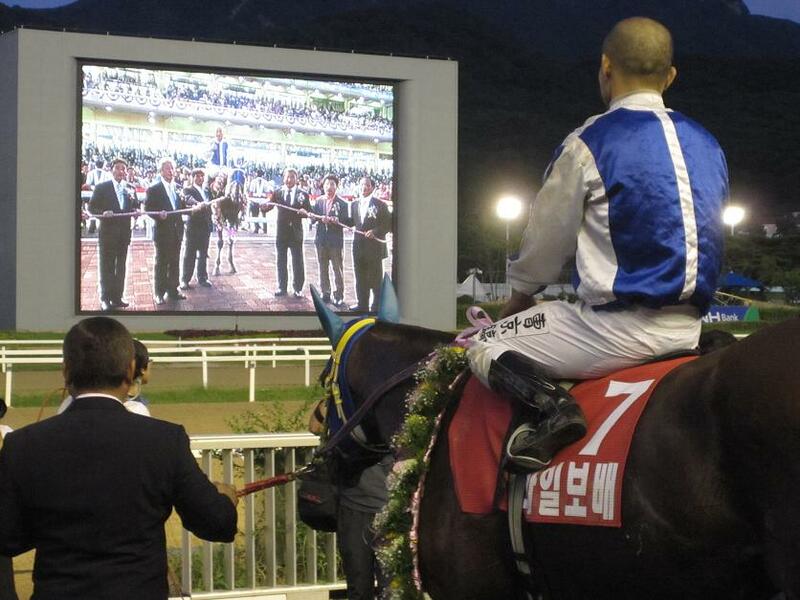 Punters at Seoul Racecourse gasped as the horse they’ve seen dominate for the past two years went walkabout.There was still a stunned atmosphere in the air thirty minutes later as the field went to post for the SBS Cup, one of the track’s floodlit summer highlights. 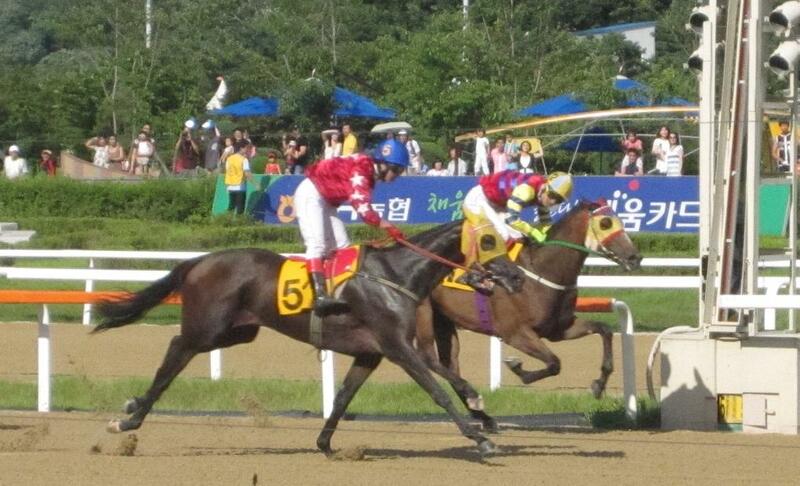 While 2008 winner Baekpa was sent off the even-money favourite, her customary late-run came too late to catch Wangson who, in another close finish, hit the line a neck ahead of Baengnyeonbong with Baekpa a further half-length back in third. It was a second big race win for Wangson and Kim Young Jin after their 2009 victory in the Sports Chosun Cup. The ever popular Baekpa will surely be back to fight another day. She just couldn’t make up the ground in time. The recriminations over Dongbanui Gangja’s performance, however, will be longer and more bitter. Korean racing’s unstoppable force collides with its immovable object at Busan Race Park this evening as Dongbanui Gangja, double Grand Prix winner and unbeaten in twelve races, meets Tough Win, two years his junior and victorious in all seven of his starts. This could be the first of a series of meetings between the pair and, all things being equal, Dongbanui Gangja should win. This time. Nevertheless, he’s only raced twice this year and last time out drifted so far wide in the home straight that he was very lucky to beat the unheralded Big Sox. Jockey Moon Se Young, stepping in for the injured Choi Bum Hyun will need to make sure there’s no repeat of that against a much classier field on Busan’s punishing and unfamiliar track. The Others: Don’t rule out a surprise. 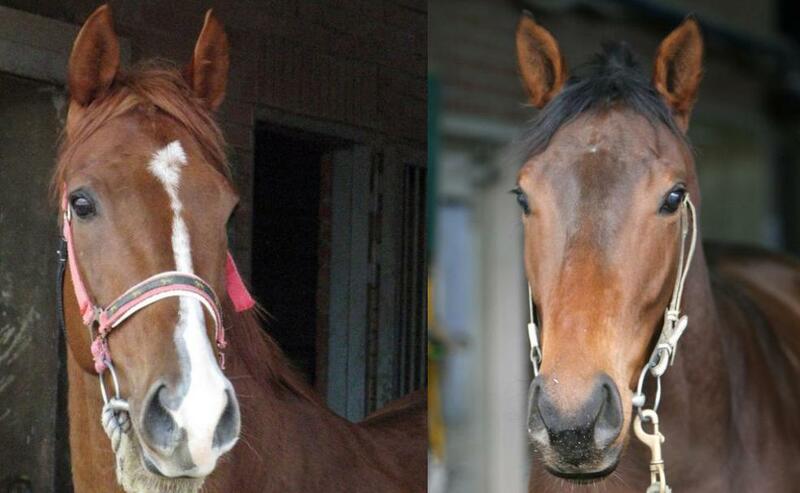 Neither of the two favourites have run at Busan before and Seoul horses have a less than stellar record at the track. Seonnyang Yongsa is in top form while the seven-year old Crafty Louis looks back to his best. Meanwhile two domestic bred horses will take their chances. Yeonseung Daero and Yeongung Manse have both successfully mixed it with the foreigners before. Whether they can take on the likes of Dongbanui Gangja and Tough Win though is another matter. The Busan City Mayor’s Cup is race 4 of a six race card at Busan today which runs from 4:30pm to 9pm. The big race is off at 7:10pm and will be simulcasted live at Seoul Race Park. Baekpa will step out onto a sodden Seoul Race Park on Sunday evening returning to the race which saw arguably her greatest triumph, as she bids to regain the SBS Cup. 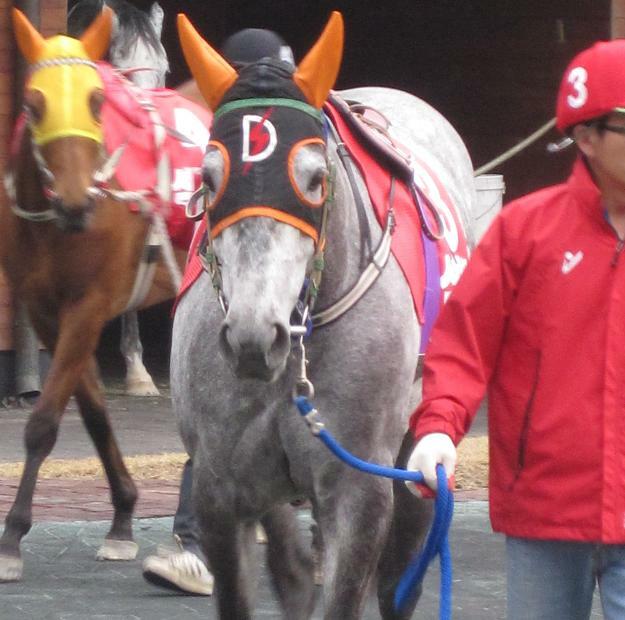 As a four-year old in 2008, the grey came up against two-time President’s Cup winner Myeongmun Gamun, then at his zenith. She never gave him a look-in as she led from gate-to-wire. What followed for Baekpa was unfortunate. Sent to the USA as part of the KRA’s ill-judged experiment with sending domestic bred horses to the US. She looked uncomfortable and was humiliated in all her races. Lame on her return home, she was sidelined for nearly a year but, like her older brother Baekgwang a year ago, she made a remarkable return this Spring. After finishing fourth in the Ttukseom Cup, she would go on to win a big Allowance race in June which has now set her up for the SBS. 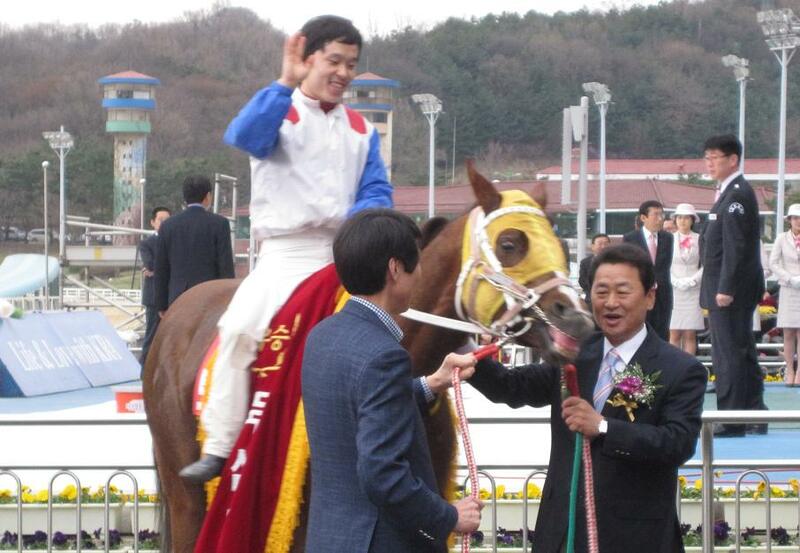 Winning the Ttukseom Cup that day in April was Triple Seven. 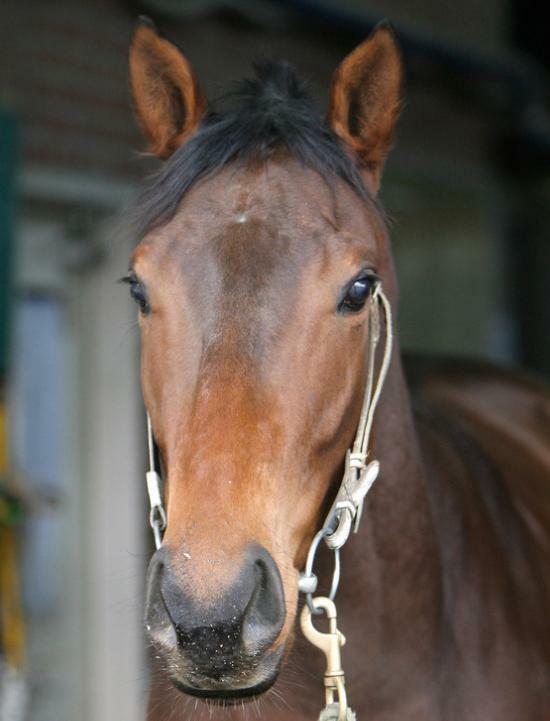 Currently ranked the top domestic-bred horse on the peninsula, he will be out to stop Baekpa tomorrow. Baekpa should be favourite though. The mare has a seven kilo weight advantage and loves the dirty conditions. It is by no means a two-horse race, however. Last year’s shock winner Hallyu Star returns while Wangson, Bengnyeonbong and Khanui Jeguk are all dangers. However, both the smart and sentimental money will be on Baekpa.